All the ancestors of the Jews were baptised into Moses. John said, I baptise you with water for repentance. But He will baptise you with the Holy Spirit and fire. Jesus said, Go ye therefore, and teach (make disciples of) all nations, baptising them in the name of the Father and of the Son and of the Holy Spirit. As we read the Bible, we discover that the word “baptism” is used in different ways. John we are told baptised with water while the Israelites were baptised into Moses. 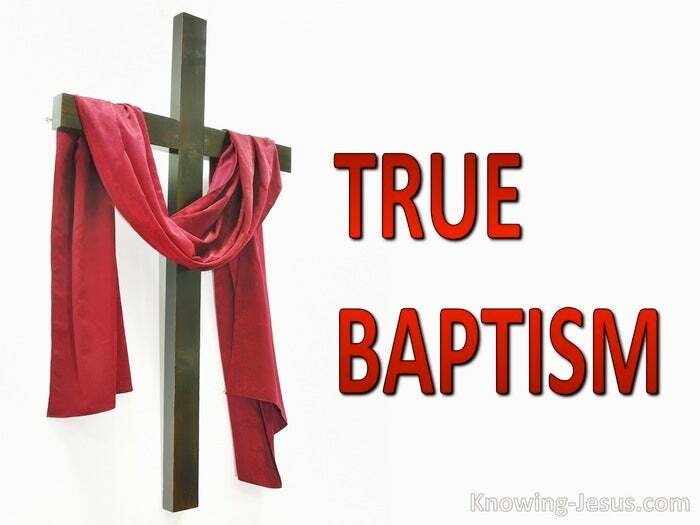 Christ was to baptise with the Holy Spirit – which is a baptism for believers, – but He was also to baptise with fire – a baptism of judgement for the lost. It is important to know what the word baptise means – and its significance, but is vital to know what each type of baptism is – or we may become confused. But in each case it refers to being “put into” something – being “immersed” or “submerged”. John immersed repentant Israelites into water – Believers are immersed into Christ. Water was the agency that John used – the Holy Spirit is the agency for believers. John’s baptism was a baptism of repentance and people were placed into water. Spirit baptism occurs when we believe – we are placed into Christ by the Spirit. 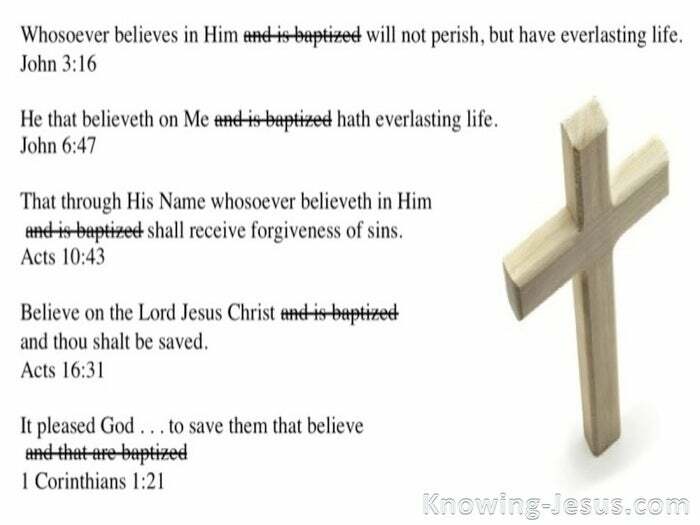 Because there was no English word for “baptise”, the word has been transliterated from the Greek language and most people think that baptism is connected with water. However, water is only one of many elements into which one can be baptised. The cloud, shading and guiding the Israelites from above, and the “sea” making a path for them through its midst and drowning their enemies behind them, were glorious signs to “our fathers” of God’s salvation; together they formed a washing of regeneration, inaugurating the national covenant life; as it trode the miraculous path between upper and nether waters. Israel was born into its Divine estate. Thus “they all received their baptism unto Moses, entering through him into an acknowledged fellowship with God. In the gospels we read that John was sent by God as a witness, to testify about Christ – the Light that was sent into the world, so that all might believe through Him. John was sent to Israel to herald their King Messiah, and he called for repentance. Israel believed in God, but had wandered far from Him and become very apostate. For centuries many prophets were sent to Israel calling the nation to repentance, and being washed in water was the outward sign of a repentant or changed heart. Washing for the Jews was the sign of cleanliness but it had become a religious ritual. The Hebrew word for washing or being immersed in water was MIKVEH. The Greek word for washing or being immersed in water was BAPTIZO. The English had no such word and so the word BAPTISM was invented.. but he real meaning behind the word is the outward expression of an inward change. John was sent by God to call Israel to true repentance. He came baptising in the wilderness and preaching a baptism of repentance for the forgiveness of their sins. John was Israel’s final prophet and he called them to repent and return to God. It is important to see the ministry of John the Baptist in its context of Israel. Paul was the man God chose to give greater insight into Church-age doctrine – and the book of Acts is a bridge from pre-cross teaching to post-cross doctrine. John’s baptism was for a special group of people at a particular time in history. It was a final call for pre-cross Israel to repent of their sins and turn back to God. And as Christ’s forerunner, John pointed Israel to their Messiah – Jesus Christ, He will baptise you with the Holy Spirit and fire. The two other baptisms John spoke of were connected with the Lord Jesus – Spirit baptism and a baptism of fire. Spirit baptism was for believing Israel who were to be baptised or put into Christ. Fire baptism was for unbelieving Israel – they were to face God’s fiery judgement – but John was not given the fuller understanding, which was given later thru Paul. As church-age believers we are baptised by the Spirit into Christ the moment we believe that Jesus is our Saviour and that He died for our sin and rose the third day. We are to grow in grace and become true followers – true disciples of the Lord and water baptism is a beautiful outward demonstration of a beautiful internal change. Disciples of Jesus are called to make an outward profession of water baptism. Sadly, some teach that without being baptised in water a believer is not truly saved! Perhaps when this is the teaching we receive we should refer to the scripture…..